The way a typical hill-climb meeting works is that it can take place over either one or two days, with two practise runs followed by two official point scoring runs in the afternoon. 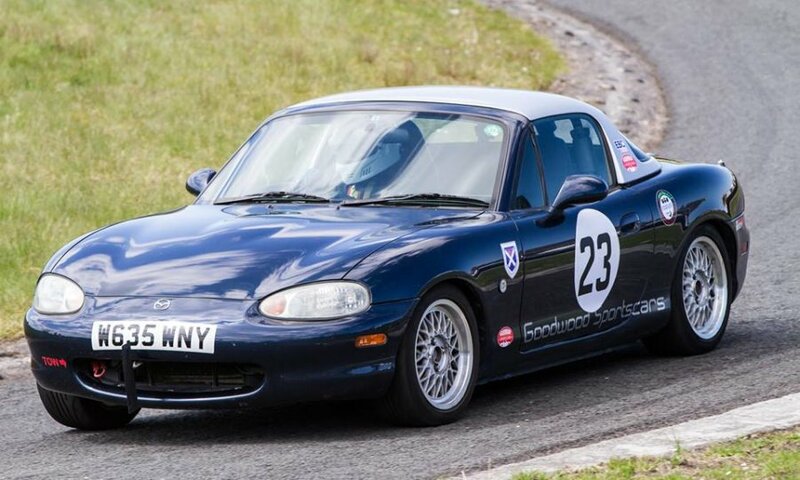 The class I compete in is solely for MX5s and the regulations are quite strictly written to ensure that major modifications aren't allowed with a view to placing the emphasis on driver ability. I have always owned a Eunos of some sort which I used for fun, simply to blast around the quiet Scottish Borders roads and also for occasional track use. 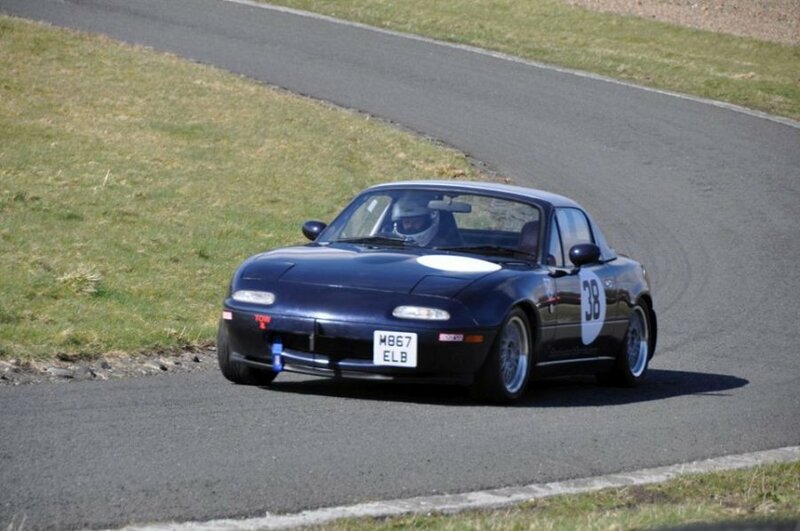 I've been a track day attendee for a few years now and my latest car, a 1995 Mk1 Eunos 1.8 R-Ltd, was great fun to drive. I had been planning a few minor modifications for the forthcoming year's track days when everything was turned on its head. 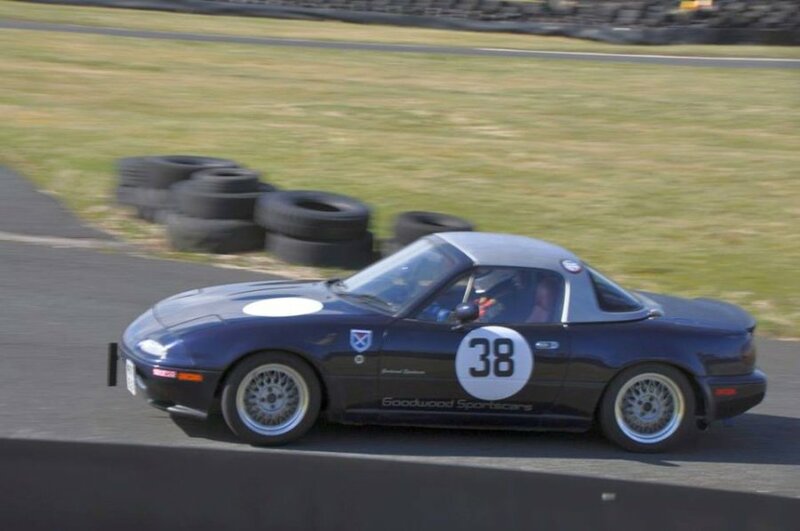 I got a call from John McGill, one of my previous customers and Secretary of the Scottish MX5 Hillclimb and Sprint Register, asking me whether I fancied entering this year's Lowland Speed Championship which was to take place at various tracks around Scotland. After a little thought, I have decided to give it a go and I have spent the last few days trying to get my head around the various regulations and sorting the required paperwork. 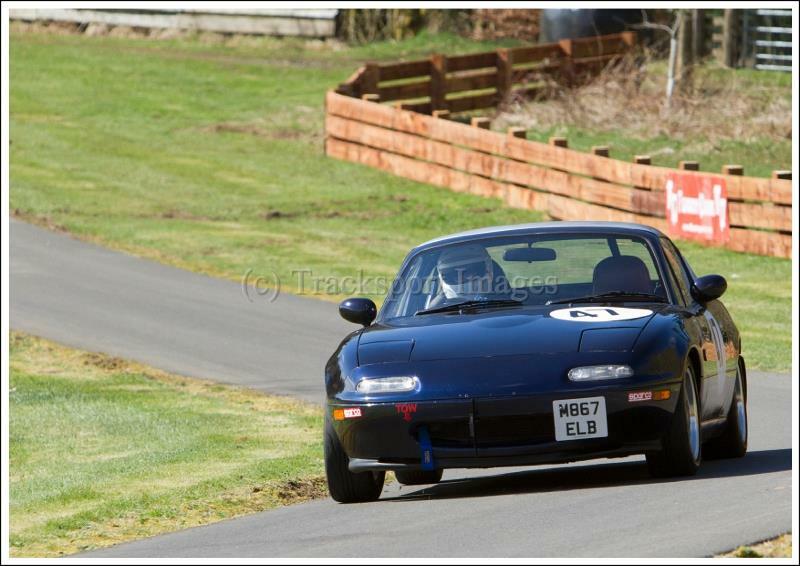 I've applied for my race license, joined the East Ayrshire Car Club along with the Scottish MX5 Hillclimb and Sprint Register and compiled a huge list of jobs needed to be done on my Eunos before the first meeting in April. All of sudden, I have a real focus on getting stuff done and I now need to concentrate on how the car works on track rather than road, as was previously planned. I'm competing in class A9 (for road-going MX5s) so refitting the interior and heater was still a good move as these are required under the class regulations (these had been previously removed by a past owner of the car). Fortunately I have just acquired a set of Meister R adjustable coil-overs, which should be ideal for now. I already have EBC Yellow Stuff pads fitted and I'm in the process of fitting stainless steel braided brake pipes. I need to get the car down to AK Automotive for a wheel alignment and to get my suspension set up adjusted and checked over. And after that, there's still a huge long list of jobs to be done. I took my Eunos down to AK Automotive today for a wheel alignment. Dan had a bit of a fight with it (seized bolts) but its all done now and feels terrific. Always amazed at how much better a properly set up car feels. So it would have been a bit of a waste to simply cruise back up the A1 when there was a slightly longer but much more interesting route home available. This also gave me a chance to see how my newly fitted Meister R suspension would cope with a decent twisty and bumpy road. Its way better than standard with especially surprisingly good ride quality. It also corners much flatter but I still haven't got the ride height right. Its uneven from side to side and its probably a touch too low as I managed to scrape the bottom on fast uneven sections, so there are still some adjustments to be done yet. The new suspension set up also highlighted the limitations of the tyres - well worn Toyos. However I'll be fitting new tyres for the forthcoming hillclimb championship anyway. Great test day at Kames and very well worthwhile. 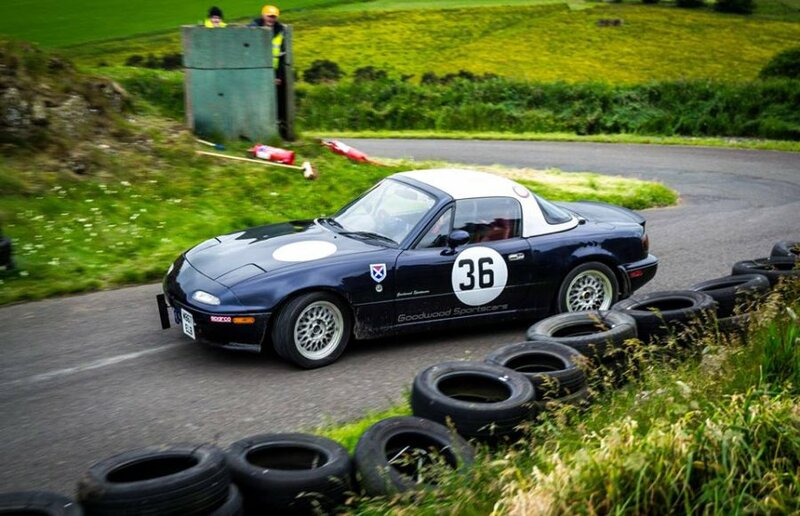 The Scottish MX5 Hillclimb Championship kicks off in a couple of weeks and I was keen to see how my car felt following the latest tweaks and more importantly, I wanted to learn the track at Kames. At the eleventh hour, my new track tyres (Nankang NS-2Rs) finally turned up and I had them fitted just in time. And all in all, it was a pretty successful day. Turn out was excellent with 15 or so MX5s turning up despite properly horrible weather - the Met Office had issued a weather warning thanks to seriously strong wind along with horizontal rain. However drainage at Kames is first class and the track was surprisingly good all day. The more time I spent out on track, the more confident I got and the harder I could push. The car felt great but its pretty obvious that any more speed is going to have to come from me rather than the car. Back in the paddock, we were talking about how we could go faster when competitor Danny Archer summed it up by saying that the easiest way was for us new guys to simply grow bigger balls. 100% correct. Remember me saying how helpful everyone was? At the end of the day just as I was about to leave, a fellow competitor asked me which route I was taking home; when I told him, he mentioned that I would be travelling quite close to his house and then gave me his phone number just in case our temporary heater hose repair gave up, mentioning that he had a garage full of tools and equipment. In the end, the car got home perfectly well (it fact it just flew back - a proper quick journey) but all the same, thanks Archie - very much appreciated! Thats the first round of the Scottish hillclimb championship over and done with and it was rather eventful and very enjoyable, to say the least. So off I set, in the pouring rain. Ah well, rain's not good but I suppose it could be worse. As I turned off the M74 on to the west side of Scotland, I noticed the hills looked odd, almost white in places - in fact it almost looked a bit like snow. Indeed it was snow and as I pulled into Kames, the wind picked up and the snow came and went, eventually settling into freezing rain showers. Terrific. Fortunately these soon faded, the sun came out and it was time for scrutineering. Straight away there was a problem. The scrutineer picked up my helmet and declared that he hadn't seen one of these in a very long time (its an OMP GP). I was mentally trying to remember when I bought it - probably at least 3, 4 or may be even five years ago - when the scrutineer declared it well and truly out of date, could not be used and announced that he would be impounding the helmet for the rest of the day. I couldn't understand this as I had read the MSA Blue Book section on helmets many times and was sure that it was legal. In fact a closer read of the fine details when I got home revealed that I had missed out two crucial letters. My helmet conformed to BS6658 Type A. The version that was legal was BS6658 Type A/'FR' (for Flame Retardent) and that 'FR' made all the difference. I have to say the the scrutineer was very helpful and immediately found me a spare helmet ( kindly loaned to me by one of the chief marshalls). By the way, when I got home, I found the receipt for my old OMP helmet, dated 2005, somewhat older than I thought! Everyone kept reminding me not to try too hard on my first practise run and I took this advice a little too seriously. However hillclimbing is a very particular discipline: there's no mucking about getting warmed up, feeling your way around and then trying to get up to speed. The second you leave the line, the stop watch starts and you have to go flat out, whether the tyres and brakes are warmed up or not and with no messing around. I immediately forgot all of this, started gently and built up speed. The track was so cold with little grip resulting in a seriously sideways moment out of the hairpin (which discouraged me further from pushing much harder) and the result was a pathetic time of 119.79 (seconds), slow by any standards. I realised that I had been way too cautious so for the next attempt, I wanted to try and knock a good five seconds off that if possible. The track was much drier now but even so I was pleased to reduce my time by 9 seconds to 110.89. Thats heading in the right direction. You start to realise that you are simply competing against yourself with a constant effort to better your fastest time to date and that was my plan: to just learn the correct lines, watch other competitors and see where I could make time up. More to the point - and perhaps the biggest factor - is learning about the limits of the car and the tyres and having the confidence to push towards those limits. After today I know that the car's limits are currently much higher than mine and I need to close the gap between the two. Its a polite way of admitting that I need to be braver and push harder! So that was the two practise runs out of the way and time to think hard and push even harder. First proper timed run and I knocked off another 3 seconds to 107.93 and the final run of the day dropped it further to 106.73. So I met my targets of not being last, not crashing and not making a fool of myself though I came close with that one, thanks to 'Helmet-gate). I ended the day reasonably happy and feeling that I can genuinely find a bit more time. Another interesting and very enjoyable weekend's motorsport at Doune for the next round of the Scottish MX5 Hillclimb championship. Doune has a bit of a reputation for being fast and unforgiving so I thought it would be wise to prepare by watching plenty of YouTube videos of previous Doune hillclimbs. However nothing really prepares you for just how unbelievably narrow it is, with lots of very hard objects to hit if it all goes wrong - armco/wood barriers on one side, stone walls on the other for much of the track, not to mention trees and rocks scattered everywhere. Its also incredibly steep in places - at one point (East Brae) the road climbs so steeply that, as you reach the top, you find yourself looking at the sky and the treetops and actually have to turn in completely blind. It all looked so easy on YouTube - the reality is rather different! On the bright side, it was a superbly sunny day (I got sunburnt) and the variety of cars competing was just excellent - everything from vintage MGs up to ex- F3 single seaters. An old customer of mine sent me a text the night before mentioning that he had driven the hill many times before and was happy to give me some pointers beforehand. Very welcome indeed. His advice was to take it very easy on the first practise run and just try and concentrate on learning the lines, so that was the plan. First run was 68.88 seconds - not too bad but filled with minor mistakes, wrong gear at the wrong time, braking in the wrong places etc but at least I made it to the top without hitting anything. That sounds like I'm joking but a few other competitors got caught out and re-arranged the shape of their cars slightly. Next practise run was better, knocking 4 seconds off my first time giving me 64.77. Heading in the right direction then. Again lots of waiting around, thanks to a very large entry list and even more competitors chucking their cars at the barriers. On to the proper timed runs next and I'm determined to resist the urge to lift and I want to push a little harder. This run felt a little more tentative - more so than my second run - but its still a touch quicker again at 63.97. And then it was all over. Thanks to the number of accidents and the damage to the barriers, time was running out and the organisers cut the day short, cancelling our final run. Very frustrating indeed. The one thing you need at Doune is plenty of time out on track, just to build confidence and learn the intricacies of the course. And its the one luxury you just don't get. I had a total of approx 190 seconds on track which is not ideal. I'm also realising that its pointless spending any more money on trying to make the car go quicker. The car is fine - its my driving that needs improving. But thats the whole point of entering this championship - improve my driving and have fun along the way. I still think I need much more track time in the car, learning how hard you can push and what happens when you push too hard etc. I'm going to investigate some more conventional track days to help on this front. Another thing the YouTube videos don't show is how good the view from the top of the hill is. 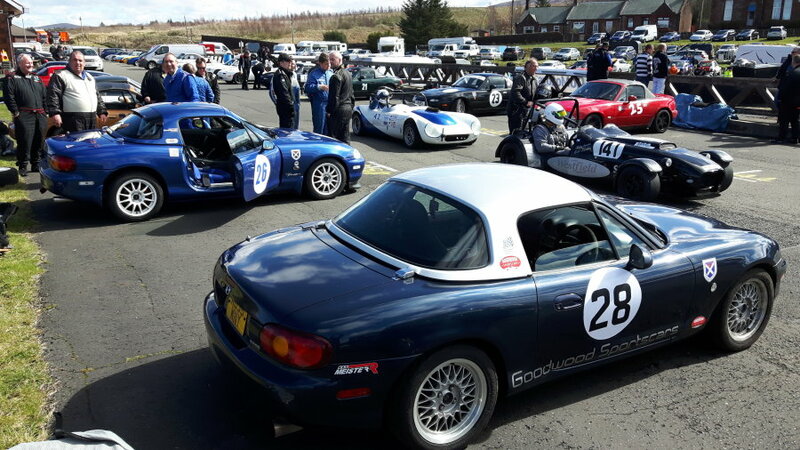 Due to the nature of the track at Doune, you arrive at the top of the hill and enter a holding paddock and wait there with the other cars in your group until the track is closed for few minutes allowing you all to drive slowly back down the hill. So you arrive at the top as fast as possible and pull into the holding paddock; you're hot and sweaty, the adrenalin is still pumping hard and your heart rate is off the scale and you step out of your car into the tranquility of a paddock in the trees thats high up on the hill with superb views, down over the main paddock and for miles over the Scottish lowlands with the odd snow-covered mountain top in the distance. Slightly surreal to say the least. Another highly enjoyable weekend, made all the more enjoyable by spending time with the other members of Eunos Ecosse. 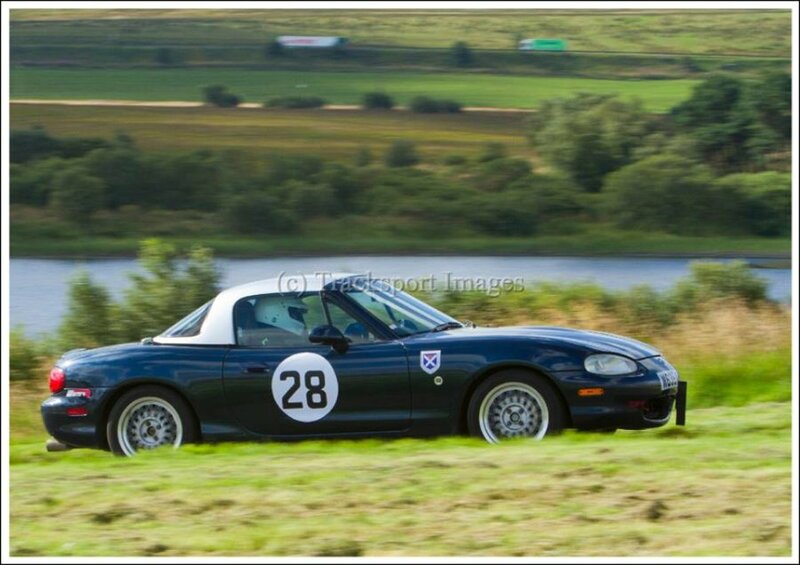 That was another cracking weekend at Forrestburn competing in the Scottish MX5 hillclimb championship. In fact this was probably the most challenging track yet: a combination of steep hills, blind bends and a tight twisting track that requires 100% concentration at all times. A big thanks to fellow competitor Henry Simmons who walked the track with me on Saturday morning, patiently explaining the correct lines etc. Invaluable stuff. A couple of the lads there showed me their devices which effectively lock off fifth gear, to make sure that you could not accidentally go from second to fifth (you never need to use anything above fourth gear on most hillclimbs). I wasn't actually convinced that this was a real issue as I've never managed to accidentally select fifth anyway. So of course, first practise run of the day and, I blast away from the start line, wheels spinning and full of enthusiasm and needless to say, I go from second to fifth, losing a chunk of time. Henry reckoned a good target for someone who hadn't driven the track before would be 65 seconds. My first run was 64.99...phew! Second practise run of the day and I actually manage to change gear properly and push a bit harder and my time improves to 60.22. I'm sure I can get below 60 seconds. And onto the actual competitive runs and unbelievably, I do the second to fifth gear thing again giving me a 61.29. I never, ever go from second to fifth accidentally - especially in an MX5 - so I'm really annoyed. Last run of the day and my last chance to get below 60 seconds. And its an OK run and I manage 59.92. Even so, thinking about it later, there's bags more time to be had here; its just a matter of learning the track and making sure I hit all my apexes etc. I headed home slightly sunburnt and with lots to think about. At least I've got the next day - Sunday- to have another go. Attendance on both days was excellent with a great turn-out of MX5s. The guys from our club (Eunos Ecosse) are good chaps to be around, with lots of help, plenty of entertaining conversations and daft stories. The people you compete with are a big part of what makes the day so enjoyable. Of course Sunday started with properly horrible weather: strong winds and horizontal rain, meaning any chance of improving times was pretty well impossible. In fact my first run was disastrous: the track was super slippy and dumping the clutch at the start line just resulted in the wheels spinning and the car hardly moving. Once underway, I didn't even see any of my apexes, never mind actually hit them. Grip was terrible and I was way too tentative resulting in a pathetic time of 71.12. I got my act together slightly for the second practise run and even though it was still chucking it down, I managed a 66.04 - slow but at least I stayed on the track. Fortunately, over lunch, the rain stopped and the sun came out drying the track nicely and I improved to 60.03, so close to my sub-60 second target. So on to my final run of the weekend and my last chance at beating my personal target time. This is one of the great things about hillclimbing - its as satisfying simply competing with your self and trying to beat your own previous best times as it is trying to beat your fellow competitors. Almost unbelievably, yet again I managed to select fifth instead of second just after the start. Even so, the rest of the run went really well despite me entering the final tight corner way too quickly and slithering through completely sideways, giving me a time of 59.11 seconds. I'm certain that there's still more to come but that will have to wait until next time. I really need to sort out the gearbox clamp mod too as out of eight runs, I went from second to fifth gear three times. I swear someone put some kind of bad magic spell on me. Next event is Kames at the end of July, though there should be a track day or two before that. 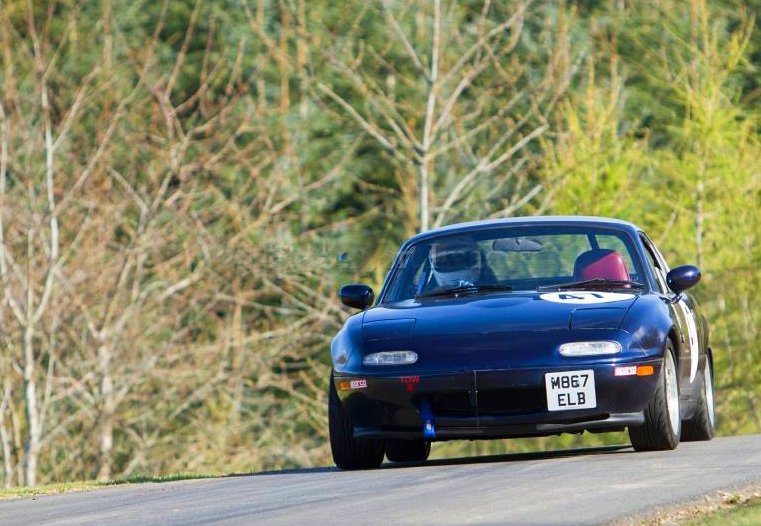 The latest round of the Scottish MX5 Hillclimb championship gave me the opportunity to try out the new Mk2 RS 1.8 which I'm now going to use for the rest of the season in place of my old Eunos Mk1. My gut feeling was that the Mk2 might be quicker but the main reason I've chosen to run with this is simply condition: its just so much better than the Mk1 with a near-immaculate underside. So onto Kames and a reasonably nice dry day. Kames is a short, narrow track with a couple of really challenging corners and within half a lap of my first practise run, I could feel that something wasn't quite right as the car was very nervous, with the back end in particular sliding around way more than I'm used to. I'd simply transplanted the Meister R suspension from my Mk1 onto the Mk2 but shortage of time meant that the one job I didn't get done was wheel alignment. Dan at AK Automotive had come up with a particular set up on the the Mk1 that helped the rear end stick nicely and I reckon I'd got used to that. I also think that the ride height may be a touch too high and is also slightly too soft for the mk2. Ok so thats all of my excuses out of the way. The second practise run was much better. In fact it was a full one second faster than I had previously managed in the old Mk1. The Mk2 RS definitely has more power and the ratios of the six speed gearbox are ideally suited for hillclimbs. Promising stuff, so I was hopeful of an even better time in the afternoon's proper timed runs. And then of course it rained and all thoughts of a faster run faded just like the morning's Scottish sunshine. And as expected, my first proper run was my slowest of the day. However, within an hour, the rain had stopped, the sun came out and by the time I went out for my final run of the day, the track was properly dry. I had high hopes of a really good time but somehow it just didn't come together and I was actually fractionally slower (by 3 hundredths of a second) than my fastest morning run. So I'm happy that the car runs well and is quicker than the old one but I was disappointed with my final times as I was certain that a much quicker time was achievable. 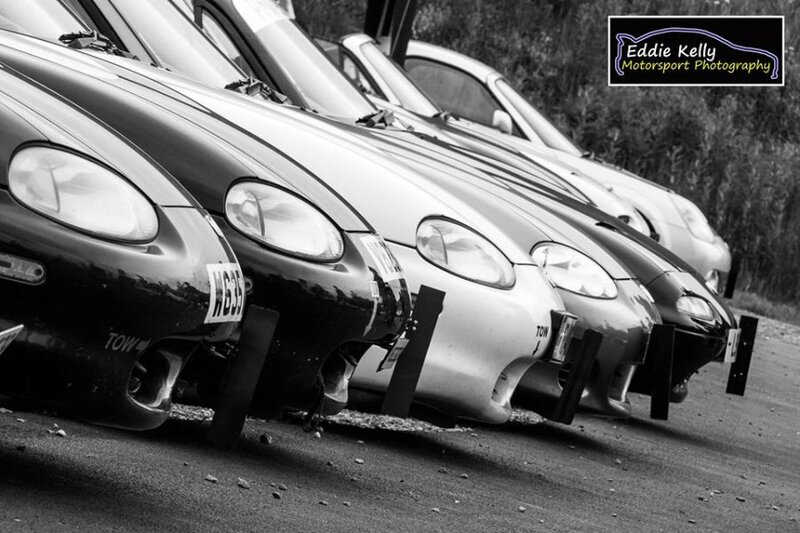 As is ever the case with our club (Eunos Ecosse), the actual racing is only part of the story. We seem to have a particularly nice bunch of guys competing together at the moment - good to be around and to exchange stupid stories with. It adds immensely to the day. And when of our chaps, Colin, had a coming together with the tyre wall and nursed his very sorry looking MX5 back to the pits, there was a near stampede of fellow competitors all wanting to help get the car back out again (see the photo here). Someone even offered to share his car ensuring Colin still had the chance to drive that day. So yet another good day's driving. I always knew that changing cars mid-season was going to be risky and I now have a big list of jobs that need doing before the next event at Forrestburn in August. 59.11 seconds. Thats the fastest time I set last time I was at Forrestburn , though that was in my old Mk1 1.8. 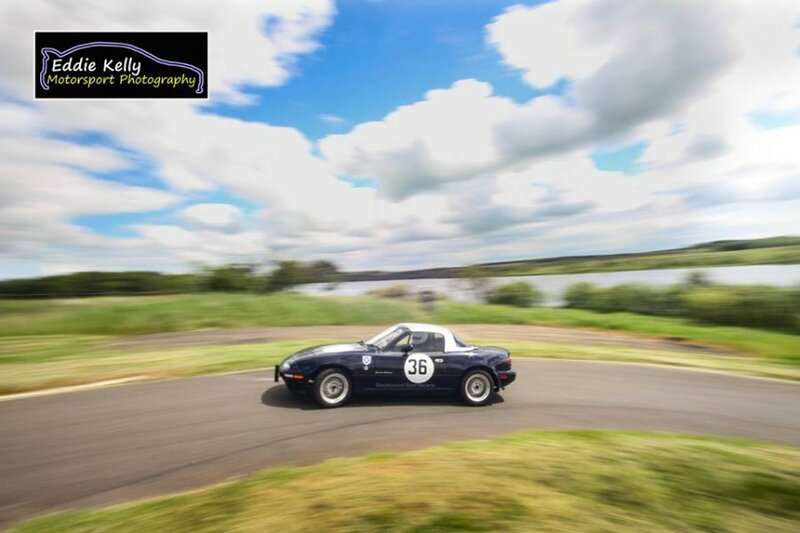 So last weekend's rounds of the Lowland Speed Championship and the MX5 Hillclimb Championship were my opportunity to see how my Mk2 1.8 would go and to try and beat my personal best. To be fair, 59.11 isn't a particularly quick time but it was my first visit to Forrestburn so I was reasonably happy with it. 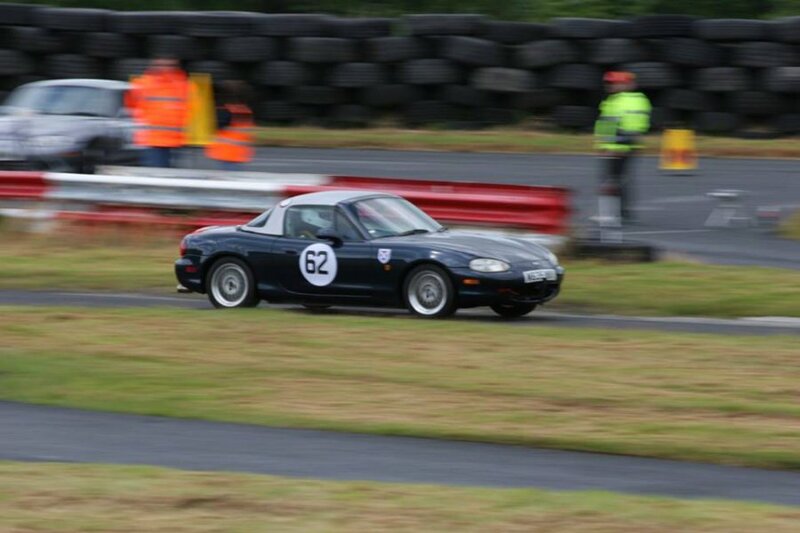 To put it in perspective, a really fast MX5 time is more like 54 seconds. The way this works is you have two practise runs in the morning, followed by two 'proper' scoring runs in the afternoon. In between, there's greasy bacon rolls, cups of coffee and lots of banter between us lot. I continue my usual theme of being too cautious on my first practise run giving a time of 63.22. In other words, too slow. For the second run, I'm a bit more switched on and try a bit harder and despite a scruffy run with the car spending plenty time going sideways in the wrong places, I manage a 59.38. Thats already close to my previous PB which looks promising. The car feels great and is obviously capable of so much more. How do I know that? Well this is one of the quirks of hillclimbing in such a tightly regulated championship. There are other very similar cars to mine (in terms of power/weight). So on the whole, if someone is faster than you, its usually because they are a faster driver. Its painful to admit but its the plain truth. Ok, experience plays a big part and having competed at a particular circuit many times before definitely helps. But a lot of it is down to confidence in your car and knowing how hard you can push before you reach its limit. In the case of some of the faster guys, its being able to drive at the very edges of the car's ability and simply having fantastic car control. So it all goes to emphasise the point that I need to spend more time in the car, find out how hard I can push it and improve my car control skills. Sounds easy doesn't it? The afternoon is nice and dry and track conditions are great and I push a touch harder and beat my PB with a 58.88. As usual, there's the odd mistake and I'm sure I can go faster and sure enough the final run on Saturday sees a further improvement to 58.49. Thats OK - hopefully I'll be quicker tomorrow. In fact having an overnight break is good: you get time to mull over what happened. Is there a better line on a particular corner? Am I being brave enough and keeping my foot hard down when every part of me wants to lift instead? 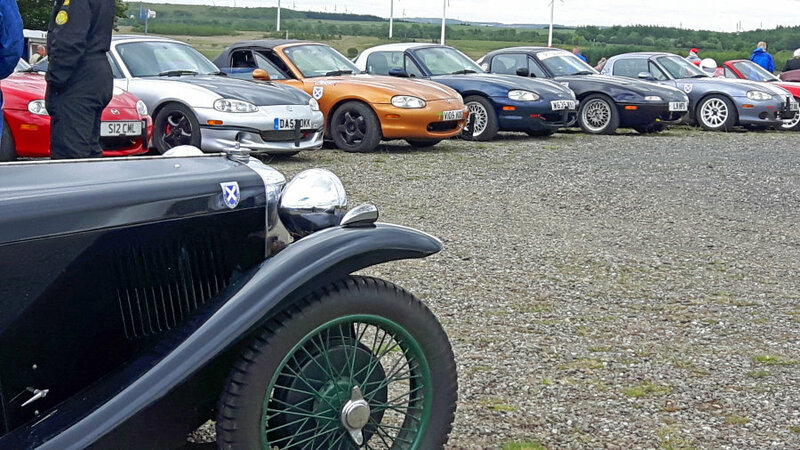 Sunday is an altogether better day weather-wise, bright and sunny and again, the Eunos Ecosse turn out is excellent with MX5s outnumbering other marques by a huge amount. First practise run is a reasonably good 58.57 (six tenths quicker than the fastest time set in my old MK1) but again its a scruffy lap with a big unintentional sideways moment at a spot ominously called 'Boulders'. In fact I should tell you about 'Boulders' because your ability to take this corner well has a massive impact on your final time. So leaving the start line, its flat out in first, second and then third gear where you bounce off the rev limiter while passing alongside a BIG stone wall, through a series of sweeping bends. Then the track climbs very steeply and as it reaches its peak, it curves around to the right and then drops sharply to the next section. So as you approach the peak, you can't see much other than the sky and the marshalls post on the right, so its a matter of having a bit of faith and turning the wheel before you can actually see where you are going. The trick is to scrub off just enough speed to get up and over. Sounds simple but its easy to brake much too hard and loose bags of speed. And if you get it wrong and spin off, there are a number of whacking big boulders hidden in the deep grass, hence the name. The fastest chaps tell me that they don't brake at all but merely lift off a touch - very brave! I'm still learning how late I can brake here but its getting better every time as I get a little braver. For my next practise run, I decide that I need to simply be smoother everywhere and this approach works well with a calm and drama-free run. Only problem is, I'm slower at 59.19. Bugger. So first proper run of the day and its back to Plan A and just push hard everywhere resulting in a 57.94, much, much better and yet another PB. As ever, I'm convinced I can go quicker. So I'm looking forward to my final run of the day but it goes wrong pretty well straight away. In the run up to the blind 'Boulders', I'm momentarly distracted by a chap in a fluorescent jacket in the marshalls box who's waving his hands wildy and I lift off, thinking there is a problem on the track ahead. I almost instantly realise that he's a photographer who's just having an animated conversation with one of the marshalls but I realise this too late and my time is destroyed. Ok so its number 348 from 'The Racing Driver's Book of Stupid Excuses' but I was pretty annoyed at the time. I think the time was 59.00 (I didn't even bother to write it down). Even so I was reasonably happy with my fastest time - at least I'm moving in the right direction and I've no doubt that at the next Forrestburn event, I'll be quicker again. It was another great weekend with the usual entertaining company of a smashing group of competitors. Lots of laughs, lots of silly stories and lots of theories as to why none of us are quite as fast as we want to be. Just brilliant fun. 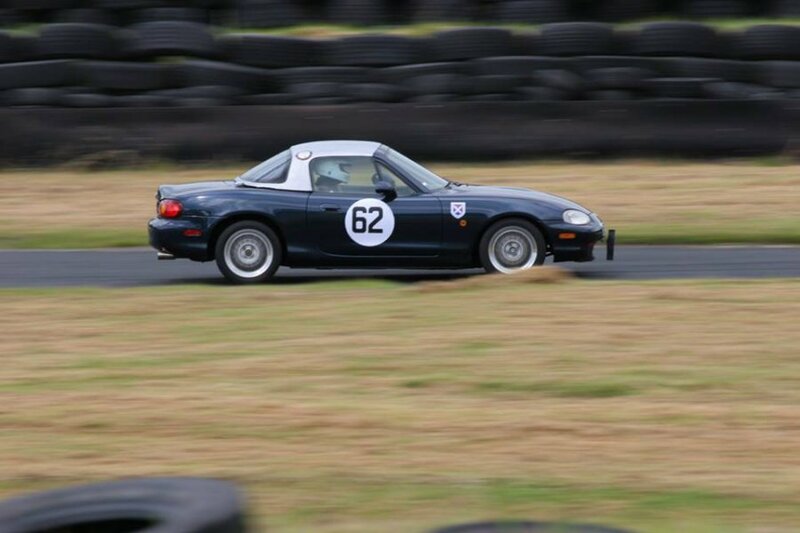 Last weekend (April 9th and 10th 2016) was the first rounds of the 2016 Scottish MX5 HillclimbMX5 and what a cracking weekend it was. Hillclimbing is a bit like golf (now just bear with me) in that apart from competing with the other chaps for overall position, you are also competing with yourself, trying to better your previous best performance at a given venue. The term you hear all weekend is Personal Best or 'PB' for short. So with that in mind, I checked my PB for this circuit (Kames), 105 .62 seconds, achieved in July last year and of course this is what I wanted to beat this time out. Even if I could shave a few tenths off that - or even a full second or so - to me, that would be a big success regardless of what else happened. Over the quiet winter period, I had toyed with the idea of an engine rebuild or a change of dif to one with shorter ratios but my thoughts were that this would mask any improvements in my driving and give a slightly false impression of where I am. Instead I simply spent bit of time ensuring suspension set up was as I wanted it with ride height re-set and I simply attended to a long list of trivial jobs on the car (better harness mounts, make a GoPro mount, a better cold air feed etc). Saturday saw an excellent turn out with around MX5s of various colours and flavours in attendance. It was good to see everyone again but it was soon time for our practise runs. First run was nice and steady, reminding myself of the quirks of this short, tight and very challenging track and that gave me a 108.80. Ok for the year's first timed run. Next time out and I dropped this to 105.63, just one hundredth off my PB - looking promising. It was good to chat to other more experienced drivers during the breaks and get some idea of different lines so with this in mind, it was off out on my fnal practise run and this resulted in a 103.88, some 1.8 seconds better than my previous PB. Very pleased with that then. On to the proper points scoring timed runs and I improved further to 103.34. Fortunately it cleared up and the weather improved leaving us a nice dry track. The plan for today was to at least match yesterday's 103. And on the second practise run, I got the time down to 102.47. I was pleased with that but couldn't help feel that a 101 run was do-able. So for the first of the points scoring runs, I decided to push a touch harder. A bit too hard as it turned out as I lost the back end slightly on the exit of turn one, putting me onto the grass and just missing the tyre wall, Even so it was decent run (103.40) and would have been so much quicker if I hadn't gone off-road (thats my excuse anyway). My final run was 102.74 which I was disappointed with at the time as I know I could have gone quicker but in hindsight, I have knocked over three seconds off my personal best so I can't really complain. What was fascinating was just how tight the rest of the field was: less than a couple of seconds covered the whole of the mid-field and many drivers are mere fractions of a second apart. It looks like its going to be a very competitive season to say the least. After the last event at Kames just a few weeks ago, where I managed to go quicker than I had ever been before, I had reasonably high hopes of a good weekend. Conditions were good with warm-ish weather and a dry track and I had spent a little time thinking over my whole approach to this latest event. Sometimes, you need to go slow to go fast... For example, at the final hairpin, its more important to get a clean exit just to ensure that you carry as much speed as possible as down the long-ish final straight. This means a steady entrance into the hairpin is important with as little sideways action as possible. At least this approach seemed to work for me. I had also decided to try a couple of different lines to other sections in the hope of beating my previous personal best time of 102.47. The car feels terrific at the moment and the Nankang NSR track-biased tyres are wearing in well and are definitely getting quicker. I'm just getting nicely comfortable with the car which has to help. I often have a bit of a pointless potter for my first practise run but this time, feeling confident, I decided to push quite hard, right from the start and despite a slightly cold and slippy track, my first time of the day was an encouraging 102.74, less than three tenths off my PB. So a good start and as there was now no real pressure for the second run, I felt very relaxed and found it surprisingly easy to push harder. The car felt just superb and the whole run was easy, relaxed and undramatic so you can imagine how surprised I was with a time that sliced nearly two seconds off my earlier time and 1.7 off my previous personal best, at 100.87. Any time around 100 seconds in a road car around Kames is pretty quick so I was well chuffed with that. No less than 15 MX5s of all flavours turned up and competition was very close indeed with most of the mid-field separated by less than second or so. Its all very friendly though and there's lots of help and discussion about technique and fastest lines. The serious business began after lunch, so fuelled up on a large portion of the on-site cafe's fantastic chips, I headed out hoping for a repeat of the morning's fast times. My first run was 101.62, my fastest ever point-scoring run but I've already proved to myself that I can go quicker, so ultimately a touch disappointing. Last run of the day and my last chance to for yet another PB. Frustratingly, it was good but not good enough at 101.66. It proves that one very fast run is good but putting together a consistent performance really matters and this is something for me to work on. The next event is Forrestburn which is fast, quite technical and a real test of bravery thanks to a steep climb to a blind crest that dives off to the right where you least expect it. I should be another good measure of how both me and the car are progressing. The day starts off fine and dry and as ever, there's a terrific turnout with a superb mix of cars - everything from hugely modified Imprezas and Peuget 205s to the usual gaggle of super-fast Caterhams, way back to a 1930's Bentley. Its a car enthusiasts delight. My times are good with the first run being a 57.61. I'm just struggling to see where can find any more time or speed, so I try a couple of different lines and even look at exactly what gear I'm using and where I'm using it, just to see if there's anything faster. My time? 57.76 - fifteen 100ths of a second slower. I try something different again and this time its 57.75: at least I'm consistent. And then for the actual point-scoring timed runs, it rains and utterly soaks the track and this is where I realise that I still have work to do. I'm simply just not as confident in rain as I should be. That said, the car was all over the place, sliding everywhere and I'm lucky to even make it to the finish line - proper scarey stuff. These Nankang NSR tyres are track biased and work brilliantly in the dry but in the wet, they can be a bit of a handful. For the second run, I leave the line and accelerate hard through the gears and with a stone wall on one side and an armco-lined high bank on the other, its a matter of bravery/stupidity and holding your nerve. I manage that OK but at the next downhill section, I totally lose the car, touch the grass and despite sliding all over the place, somehow find myself still facing the right direction, heart pounding and adrenalin pumping at an all time high. This is enough for me: I'm here to enjoy myself rather than end up writing my car off so I finish the run steadily and I'm just pleased that the day is over. The times are just pitiful - must do better next time. Sunday October 2nd. 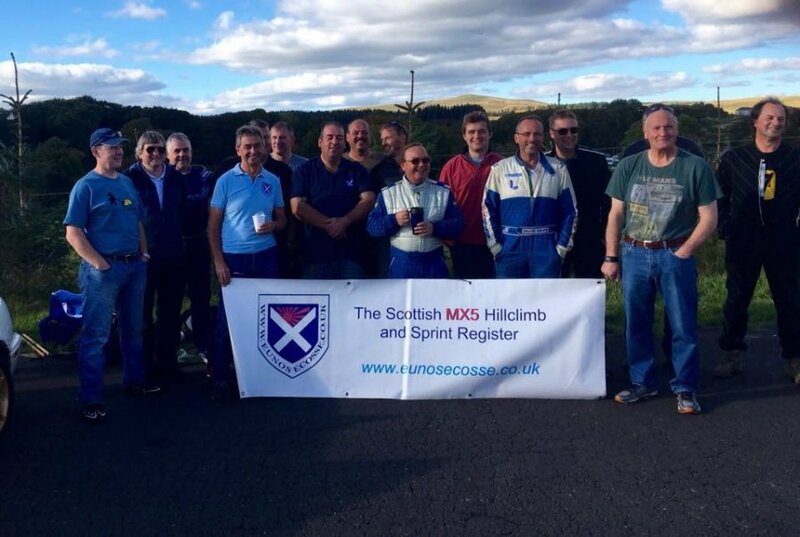 Its the final round of the 2016 Lowland Hillclimb championship and as ever there was a strong turnout from the Scottish MX5 Hillclimb and Sprint Register. Held at Kames near Muirirk in Scotland, it was one of my last chances of the year to give my MX5 a good blast. The spec of my car hasn't changed all year so it was just a matter of checking suspension settings, basic fluid levels, packing the boot with tools, spare fuel and lots of junk food to eat and away we go. Its one of the good things about an MX5 - they're pretty strong and can be driven hard without too much messing about. The format was to be two practise runs followed by two timed runs with the possibility of a third timed run if time permitted. A total of 55 competitors entered, in everything from a Suzuki Cappacino to a monster of a 650bhp+ 4.0 Judd-powered Pilbeam single seater along with no less than 16 MX5s. As usual, there was lots of general clowning around, daft stories and good company between runs as well as some seriously though friendly rivalry. My first practise run was a touch tentative as the track was cold and grip levels were low so my time of 104.26 was OK for starters. Next practise run was 102.63 followed by a proper point-scoring timed run of 102.57. Again, OK but nothing special. My personal best at this track is 100.80, but to be fair, I've never even got close to that time since I achieved it earlier this year, with a run in the 101s more likely. It almost felt as though it was freak one-off run, never to be repeated, which was becoming very frustrating. Rivalry was a bit intense with seven of us covered by around 1.3 seconds at this stage, so the slightest improvement in time could make a big difference. Putting this lot into practise gave a much better time of 101.36 which pushed me up into 5th place. In the end, the organisers decided to give us a third run which was a bit of a bonus. I was already happy with my quickest time so there was no pressure to do anything special. Even so, I went out for my very last run of the season, pushed on a bit and managed 100.51, a new personal best for me. To my surprise, it pushed me up to 4th place and won myself a trophy but as I had no idea I had done that well, I didn't wait around for the prize-giving and headed home and will have to collect my trophy later. So a very good day for me and its given me lots to think about what I should do next year. The car feels terrific at the moment but I know there's more weight to be removed and a touch more power to be unleashed. After all, I really need to get under 100 seconds at Kames and I'm only half a second away! There's also the chance to compete in the newly-formed Cross Border Speed CHampionship too which looks very attractive, with events at Harewood, Three Sisters and Blyton. 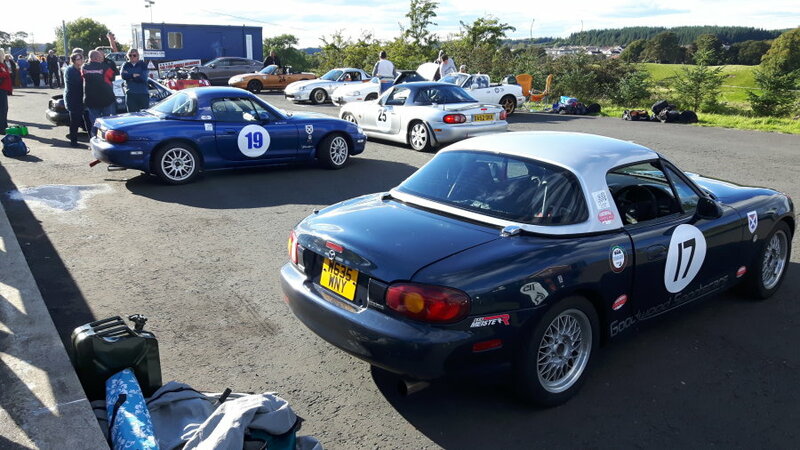 I really must thank everyone in Eunos Ecosse (the Scottish MX5 Hillclimb and Sprint Register). Its hard to think of a friendlier and more helpful bunch of people and the atmosphere at every event has been just terrific. Here's a group photo of us lot, (I'm on the far right) taken on the last day of the season. We now have over 30 members and it looks like we'll have even more next year. Forrestburn Hillclimb Speed Championship - June 24th. Thanks to various delays and misdemeanours such as a delay in getting my car ready and then a whole host of family get-togethers, holidays etc, this was my first event of the year. There was very little to do to the car other than a new MOT, an oil and filter change, a check over and re-set of suspension settings - and thats about it. Forrestburn is one of those tracks that I just struggle to get to grips with. Its short, fast, twisting and tight and its very hard to get into any kind of rhythm. Even so, I was hopeful of a good day and had an eye on my previous fastest time there: surely I could beat this? It was great to see my fellow competitors after a long break and the usual banter was as entertaining as ever. On to the first practise run and as I was lining up to go out, it started to rain. And then it stopped and thanks to the high wind, it started drying fast. And then it started again - and stopped again and ..well you get the idea. Not ideal and while the track was quite slippy, my first time was OK. My second practise run was some four seconds faster thanks to a bone dry track. However, it was still a long way off my previous best time so for my first timed run, I decided to try and be a touch smoother, for example making sure I got a good run out of the hairpin in order to carry as much speed as possible along the following straight. It sounded good in theory. In practise, it was a stupid idea as I was actually slower than before. I reckon with an MX5, an aggressive driving style works best - which sounds easy but just isn't. My final run was my fastest of the day, but I managed to select neutral at one point and bounced off the rev limiter a couple of times in other parts of the track, something I've never done before but managed to do regularly on this outing. So it ended up being one of those days where I just knew I could go quicker but simply didn't get it quite right. Frustrating but still really good fun. The problem is that our class is getting very competitive now and its not uncommon for three or four drivers to be separated by just a few tenths of a second. Everyone is improving all the time and we're all egging each other on - its a really good series. The general consensus is that my lack of track time in the early part of the year really didn't help. I just struggled to get anything like the best out of my car. Next outing is Kames at the end of July so I've high hopes of a good run then. The video here is one of my attempts on Saturday and again, you can just hear me bouncing off the rev limiter. Must stop doing that! Very simply 2017 turned out to be a pretty poor year for me. New business ventures and too many holidays meant that I missed 80% of the events I could have entered. When I did actually get out and compete, my lack of track time resulted in below par times for me. Kames in July was a good meeting and I got the club's 'Driver of the Day' award which was a nice surprise. So now its time to look ahead to 2018. Hopefully I'll be more organised and have every intention of getting to quite a few more events.